ICAR-Indian Institute of Millets Research (IIMR), the host institution, is the nodal agency to work on all aspects of millets research and development in the country under the auspices of Indian Council of Agricultural Research (ICAR). It was established at Hyderabad in 1958. It has conducted extensive research on all aspects of crop improvement, production, protection and promotion including millet value chain, from farm to fork i.e. agri-inputs to end use consumption. NIELAN is The Technology Business Incubator “Nesting Incubation and Entrepreneurship for leveraging agri-innovations in Nutri-cereals – hosted by the ICAR – Indian Institute of Millets Research (IIMR), Hyderabad – NIELAN TBI is located in Hyderabad which is culturally cosmopolitan where the highest rate of diabetes is recorded in the country and promotion of millets as functional food will be profoundly welcome. NIELAN shall become a focal point where ideas, entrepreneurs, experts, the academic and the funding agencies shall gravitate towards creation of a new knowledge based economy. ICAR-IIMR through its TBI would like to contribute to the success of the National Innovation system, by providing the right ambience and infrastructure for nurturing innovation, technical skills and entrepreneurial talents of thousands millets stakeholders. 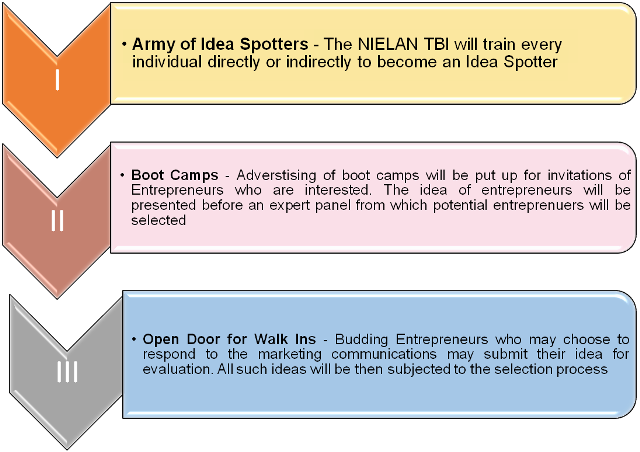 The NIELAN TBI has the requisite expertise available in-house in the relevant focal areas of Nutri-cereals and also proposes to conduct at least 88 events ranging from Sensitization Workshops, Boot Camps and Company Management Seminars. The incubator is well connected with transport and communication system horizontal dissemination of millets promotion and commercialization across the country. •	Networking with SHG’s corporate, traders, processors, food industries and policy makers and researchers.